I am 29 years old and live in Toronto, Ontario, Canada. I am married to a wonderful man named Gary. We will be married for two years on July 12th. We decided that it was time to try for a baby. After just one attempt, we got pregnant!!! I don’t think words can describe how happy we both were to be welcoming our first child. The pregnancy was great…at first. I had it very easy. No morning sickness, no nausea. It was great! One day at 8 weeks, I began spotting. I rushed to the doctor and my husband met me there. When we got there my doctor told me that if I was miscarrying, there was nothing that could be done. I was so scared. I wanted this baby so badly and prayed that I wouldn’t lose it. My doctor sent me to get an ultrasound, where I saw the most beautiful thing I had ever seen. My baby’s heartbeat. Sweet relief came over me. Afterwards, the tech gave my doctor the results and she told me that everything was fine and that it is common for some women to spot during their pregnancy. The next two weeks were uneventful and glorious! I walked around knowing that I was nourishing a life in my womb. This was so powerful to me! My husband and I bought our first home and moved in on March 6 2010. We were in such a great place in our lives. Then on March 10 2010. I began to bleed quite a bit. We rushed to the ER where I was diagnosed with a complete molar pregnancy and a co-existent live fetus. If you are not aware of what a molar pregnancy is, It is when an egg gets fertilized by healthy sperm but the egg is missing maternal chromosomes. It develops in to a mass of grape-like cysts. This baby didn’t develop at all. But, it’s twin did. I was considered high risk and was refered to a high risk OB. When I arrived at the office, the doctor told me that I had a decision to make. Terminate or continue with the pregnancy. He only asked me if I wanted to terminate because I was at risk of many potentially fatal issues. We decided very easily that God wants me to fight for this baby. We did!!! We fought hard! 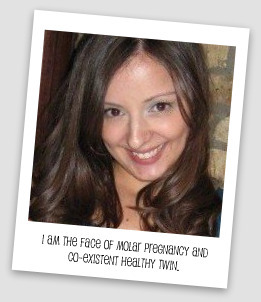 At 14 weeks, I was refered to a gyne-oncologist because of the potential of developing cancer from the mole. He was a wonderful support and saw no reason to terminate the pregnancy. I had an amniocentisis at 14 weeks and the results came back normal for the baby. We were so happy! We also found out that we were having a girl! I don’t think anything could top the feelings we had when we found out we were having a wonderful little girl. We immediately named her Olivia Marie. We loved the name and she had both her grandmother’s name in Marie. For the next few weeks, I was enjoying being pregnant and getting to know our girl. My husband fell deeply in love with her and would often talk to her when he came home from work, causing her to do somersaults in my belly. She loved her daddy. Then one day while at work, I noticed that my legs were really swollen. I called my OB and he asked me to go straight to the hospital to get checked out. I was diagnosed with early preeclampsia at 17 weeks. I spent the weekend in the hospital being monitored. After that I was sent home and placed on bed rest. On May 3rd, I was again, rushed to the hospital by my husband and sister for heavy bleeding. I WAS TERRIFIED! On arrival, I was hooked up to IV and my baby’s heart beat was monitored. She was doing really well. She even kicked the nurse when she checked for her heartbeat. It was really cute! I spent the next few days in the hospital preparing myself for having to stay there until Olivia was viable. (28 weeks). I cried a lot because I missed my home. I hated that my husband was worrying and was stressed. I just wanted to be home with him and a healthy baby. God, told me I had to stay where I was because he knew what would come next. I firmly believe that. On May 6 2010. After several minor bleeding episodes coming from the molar pregnancy, I was on the phone with my sister in law complaining of nagging back pain when I felt pop and I gasped, threw the phone and ran for the bathroom. By the time, I got there I was covered in blood. I sat on the toliet and rang the alarm. Nurses and doctors came rushing in and saw all the blood. They immediately got a stretcher for me and called for the OR to be prepped. As I sat on the toliet, the nurse asked if I was peeing. I cried and told her that it was blood. I was rushed to the OR where they told me they had to do a C-section and that Olivia would not make it. I knew that. How could a little angel of that gestational age survive?! I prayed to God to save me and take my angel to heaven with him. Olivia was alive when she was born. A wonderfully sweet nurse, cuddled her in a warm blanket until she was called upon by God. I was put out and when I woke up I was in recovery with my family, completely numb. After many many tears with my closest family and friends, we decided that we needed to meet the angel who saved my life. I firmly believe that she was my guardian angel. She was born to save my life. She knew I was risking my life to keep her and she wanted me to survive. I believe that with all my heart! We held and admired her for an hour and a half. She was so tiny but very well developed. She measured only 21cm and was 7 oz. She looked just like her daddy. She had a perfect mouth and nose. She had long legs like daddy and had my hands and feet. She looked so peaceful, almost like she had a smile on her face. She knew she had helped God by saving me. We miss her each and every single day. I have been having a very hard time with her loss. I have gone from emptiness, to hopelessness, to anger to sadness all in one day. We had a service for her and buried her. She lays now beside her cousin who died a few years earlier at 2 months old. I am happy that they are together. I visit her every week. I want her to always know that I love her and I will always be her mommy. I read her stories and sing to her. I feel like just because I cannot hold her or kiss her doesn’t mean I cannot nourish her soul. I feel her all around me. How lucky am I to have been chosen as her mommy! I came to the conclusion, that I am actually the luckiest mommy to have had spent 18 weeks with this little miracle. She made me the happiest I have ever been. I will never regret any decision I made. God must really love me to have given me such a miracle to carry and nourish. He let me borrow one of his angels. I think this has brought me so much peace and my faith in God has become so much stronger as a result. First of all, I want to tell you how sorry I am for the loss of your sweet baby girl. I am so glad you found FOLFOH though! This blog is such an incredible resource for us baby loss moms. My husband and I lost our son, Cole, on Father's Day this year. He was born at 24 wks/2 days… way too early. He struggled to live for 9 days enduring even surgeries, but is finally no longer suffering. I am like you and believe that our babies are our guardian angels. Please reach out if you ever need to talk.